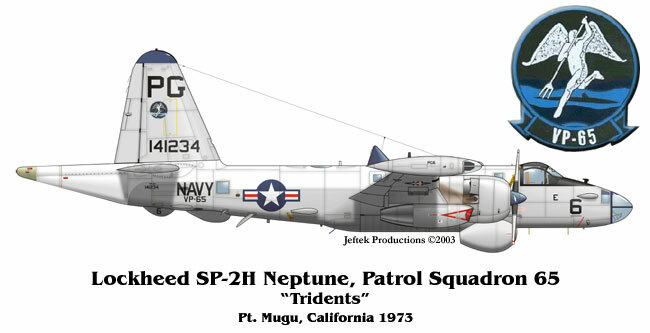 Patrol Squadron 65, the “Tridents” was established 33 years ago at NAS Los Alamitos, CA, on November 16, 1970. Following the Pueblo Call up in 1968, Naval Air Reserve underwent a major reorganization. This reorganization included the establishment of twelve land-based antisubmarine patrol squadrons. The reserve squadrons formed were structured along the lines of regular Navy squadrons with nearly identical organization and manning levels. The reorganization concept was known as 12/2/1. There were 12 VP squadrons under two commands, Commander Fleet Air Reserve Wings Atlantic and Commander Fleet Air Reserve Wings Pacific, under the control of one central authority, Commander Naval Air Reserve. VP-65 was formed from the personnel and assets of seven smaller units already in existence at NAS Los Alamitos including VP-65L1-L3, VP-22L7, VP-19L4, VP-6L5, and VP-40L6. VP-65 came under the operational and administrative control. With the closure of NAS Los Alamitos, VP-65 moved its base of operation north to NARTU Pt. Mugu. VP-65 performed a variety of functions, including maintaining combat crew readiness in preparation for any contingency that would require it to mobilize to augment Fleet forces. It also provided operational assistance to regular Naval forces during drill weekends and annual training periods. VP-65 aircrews have operated in support of naval forces in the Mediterranean Sea, Atlantic Ocean, Eastern and Western Pacific Ocean, Southeast Asia, and Central and South America. The squadron flew twelve Lockheed SP-2H Neptunes. It was during this time that VP-65 won the Noel Davis Battle “E” award in 1972, presented by the Department of the Navy to the most efficient aviation patrol squadron of the United States Naval Reserve. In October 1974 BuAer 141234, the squadron’s last SP-2H was officially transferred to the Naval Aviation Museum at Pensacola, FL where is remains on display to this day. The squadron then transitioned to the Lockheed P-3A Orion aircraft in January 1975 and remains active in 2003. Nicknamed the "Tridents" The squadron’s first insignia was approved by CNO on 18 August 1971. The central character of the design was a faceless winged man (Neptune) poised with a trident over a surfaced submarine.